he just hit 125k while fortnite is at 130k total i do get the feeling it may be a game he might stick with as long as the updates keep comin thick and fast enough it isnt going to end up as another Blackout or Islands of Nyne hopefully. Not in the slightest considering the target audience. He's being paid to atm, he's an " Apex partner " EA got several top Twitch streamers, some youtubers and flew them all out about 2 months ago to play and record footage of apex before launch for a close door event. Then they all had to stream it launch day and they have a set amount of time to stream in the launch window, They do streams afterwards promoting the game, Yt folk have a 3-5 video deal covering different aspects of the game and bullet points to cover in each video. cerebus23, spajdrik and KissSh0t like this. Question though for people that watch Shroud, I don't myself. Do you do so because he is really good at the games he plays? I don't watch him but I've seen his streams. I find him dull, but he's a solid player. I personally watch streamers because they're either really good at a game or entertaining. Never for cleavage! I never understood the appeal of watching other people play video games. you can learn a lot from watching the good players. sometimes i do it if i cant make up my mind about about a game based on reviews and other information so i look for long clips or streams to watch and assess the gameplay story and etc through those. I played it a bit, maxed settings set dsr 1620p and was like wut?? 40-50fps.. hmm, seems to be quite demanding, had to lower to native 1080p to get over 90fps..
the worst thing in this game for me so far is how the respawn system can be so easily used against you for instance several times i have dropped in with my squad and been set upon almost instantly with either no gun or a pistol with min ammo no sheild no armour just my movement and my wits yeah you dont last long when your squad is all spread out anyway instead o my squad mates picking up my res card in time i have been left to time out and thats it im out the match. kinda makes you feel doubly punished for a bad drop that is often the fault of the drop master or plain bad luck and not really you and that you were seen as more a hindrance to the squad than someone who was barely even given the chance to prove your worth and not seen as worth them spending time on giving you a res back in. I agree that it's way more demanding than it should be. I get 65-75 fps maxed out at 3440x1440, not very good for a game like this. i have dropped in with my squad and been set upon almost instantly with either no gun or a pistol with min ammo no sheild no armour just my movement and my wits yeah you dont last long when your squad is all spread out anyway instead o my squad mates picking up my res card in time i have been left to time out and thats it im out the match. If you want to play BR game, have some fun and minimize such fast drop outs, then don't play with randoms. Find 2 friends who actually know what they are doing. no guru groups? all us anti social gamers ;p.
should have enough for two full teams and gurus can kill fellow gurus then you can kill everyone else. i got gods knows how many on my steam friends and i never see hardly any of them game at all nm any of them playing the same games.i do not even know what games most are attached to but maybe 3 4 of them. but i do not play multiplayer much though i picked up tabletop simulator on sale with the intent to try and bully a few of my friends into grabbing it so maybe we could all chill bs and play some silly board games or magic or d&d mods for just about any game you can play with cards dice or etc. And then none of em were interested did not want to make a steam account, did not want to play board games, sounded silly, was kind of the point but yea . You all should figure out who all plays or wants to play in team setting, where you are located at roughly, what times are best to play for you, etc put together a few time zone compatible groups or one f it all group and try and make it work via a discord or hosted server where people could drop in drop up look for form teams or join up any time of the day or night. Could make rooms for different games. fornight room etc. Can you even make groups on Origin? Respawn boss Vince Zampella said that it has now rung up more than 25 million players, and "well over two million concurrent players" at peak. Haha that goes with everything. I love playing video games and sometimes when I'm taking a break I could watch someone else play or see how they react or see different play styles or watch tournaments and championships. I love boxing and tennis, I play these sports and I also watch people play these sports. The biggest thing with video games and big streamers is trend makers. Whats the in, whats the game everyones playing, whats the new thing.. is it worth playing? Many new generations don't know or don't go out of their way to try something or invest time in so they watch other people (usually ones that get paid anyways) and see if they should play the game. There are so many people that hate the games they play but only do so because its the "trending" game and its what people will watch aka what will make them money. Some streamers are fortunate to play whatever they want and still hold their audience. 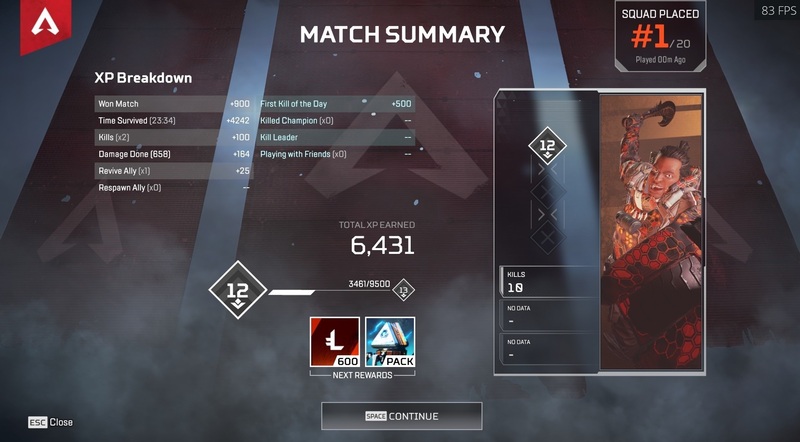 As for Apex Legends when it first came out it reminded me of Borderlands meets Destiny. Runs fairly well on my 2070 but then again theres only low and high settings. I love boxing and tennis, I play these sports and I also watch people play these sports. . I see. Glad you're enjoying stuff! I don't get the appeal of watching sports either. Participating in them is another thing, but passively observing someone else play... no way, not for me. And watching streamers is even worse. Obnoxious is a fitting word. I once read an article of the underlying psychological reasons of watching streams. Apparently, it is considered a form of social activity; to share in an experience from a safe distance while doing nothing actively. Sort if like watching a movie together. Then you identify with the streamers emotions and reactions as things happen. I can see how these things easily influence younger players. I wouldn't say watching sports in quite analogous to watching streams, but for instance I watch MMA to see the most skilled executions of technique there is in the world in that particular field, stuff that looks superhuman at times. I reckon for some they look for something similar in streams, like how good can you get if playing Starcraft is your job, that kind of thing.